“When I try to think about the future, all I can see is an enormous black curtain blocking out everything else.” I could see no way around it. I knew what I was saying did not fit with the biblical hope that I professed, but that dark cloud of despair had settled so thickly over my soul that I could see little else. I didn’t want to be overcome by depression, but it was so much bigger than me, beyond what my simply “choosing joy” could dispel. Where could I go for help? Who could free me from this invisible prison? The answer was obvious. Every Sunday school child knows the songs about God being able to do anything. But He wasn’t doing it now. He was not delivering me from my troubles, He was not wiping away my tears, He was not lifting me out of my despair. Not yet, at least. Submerged under a shroud of darkness, I waited. But for what? My tears have been my food day and night, while men say to me all day long, “Where is your God?” These things I remember as I pour out my soul: how I used to go with the multitude, leading the procession to the house of God, with shouts of joy and thanksgiving among the festive throng. The death of our dreams gives rise to the life of our worship. But the longer I waited in the dark, the more a new dream emerged. Sure I still wanted to be a cheery, engaged mother to my children, a loving, encouraging wife to my husband, a useful, effective servant for the kingdom of God. Those were good goals that were right to pursue, but they were no longer the center of my vision. Losing the ability to fulfill them had whetted my appetite for God. Send forth your light and your truth, let them guide me; let them bring me to your holy mountain, to the place where you dwell. Then will I go to the altar of God, to God, my joy and my delight. I will praise you with the harp, O God, my God. Stripped of all the other dreams in which I had formerly found significance and delight, I wanted nothing more than to be in God’s presence. I woke each morning desperate to escape into His heavenly throne room and to lose myself in all-consuming worship. I walked through each day clinging to Him with every step. And I fell asleep each night savoring the sweet comfort of being cradled in His arms. This was a dream that nothing in this life could deprive me of. It penetrated the dark barriers that hemmed me in and gave me a palpable hope to cling to. Even if I still could not envision the future, even if the thought of what lay ahead overwhelmed and intimidated me, beyond all that I could anticipate the sweetest of prospects: eternity in God’s presence. It was only a matter of time until my hope would be fulfilled, a matter of when, not if. And in the meantime, as I walked the up-and-down path of this life, there was no reason I couldn’t enjoy His presence along the way. Worship became my highest joy. I discovered that I was participating already in what would be perfect then. It was the first week of a new year, an appropriate time to look back over the events of the past year and anticipate all that would come with the new one. But unless the pattern radically changed, all I had to look forward to was more struggle, more disappointment, more weakness, more pain. Was this what God had in store for the rest of my life? Worn and weary, I lay suspended in a hammock looking up through the tree branches towards the heavens. I had not yet found resolution to the relational dilemma of a sovereign God who had ordained great suffering for me. But my soul was shattered, too broken to fight anymore. His were the hands that had wounded me. But His were the only hands that could comfort me. Part of me wanted to turn away from Him, to run away from the source of my pain. But the thought of life apart from God’s love brought even more despair than the misery of living within it. My heart is blighted and withered like grass; I forget to eat my food. … I am reduced to skin and bones. For I eat ashes as my food and mingle my drink with tears because of your great wrath, for you have taken me up and thrown me aside. … In the course of my life he broke my strength; he cut short my days. The only choice I had was to go to Him with my grief, to cling to Him while telling Him how much He had hurt me. Once again, the Psalms gave me permission to voice my complaint and the words to do it. I told Him frankly of the ways that I had been affected by His actions, and I didn’t sugar-coat it with statements of how gracious He had been to spare me from worse. Tangible experiences of His love became the balm that made my anguish more bearable. Lightning did not fall from heaven and strike me dead. Actually, I wouldn’t have minded if it did. I didn’t really want to live anymore, not with the prospect of a life filled with nothing but more suffering and pain, stretching out endlessly before me. I knew it wasn’t an option to end my own life, but it would be such a relief if He would end it for me. I fell asleep each night asking Him to do so. I awoke each morning disappointed that He hadn’t. Through the first few months of that year, like the psalmists, I rose each morning and cried to God for help. I implored Him for the strength to make it through another day, then began by putting one foot in front of the other. I often felt like I was walking on that invisible bridge over an endless chasm from the old Indiana Jones movie. But as I took each step in blind, desperate faith, His strong hands kept my feet from slipping and my soul from falling into infinite despair. I came to the end of each day shocked and grateful to have actually made it that far. In the midst of the struggle to go on, tangible experiences of His love became the balm that made my anguish more bearable. He did not “beam me up” out of my misery, but He did join me in the middle of it. The compassionate, silent hug of a friend. The gift of those sweet hours of oblivion that came with sleep each night. The poignant beauty of a song. The warmth of the sunlight caressing my face as I stole a few quiet moments in the hammock. All of these were touches of comfort from His hands, reassuring expressions of His true heart towards me. Blessed is the man whom God corrects; so do not despise the discipline of the Almighty. We sang “count your blessings” in morning prayers yesterday. There’s a line in there about “does the cross feel like a heavy burden to bear” (something like that) and prescribes counting your blessings. So, my question for your blog: what do we do with songs like this? Is there value in reminding people to count blessings? I remember people telling me all kinds of things that would “fix” me (more prayer, more bible study, more service to others, etc.). Some of them helped in small ways. None of them “fixed” me. I hate to admit this, but the rebel in me wants to stand up after a song like that and read aloud Psalm 89, which begins by “recounting” God’s former blessings and promises and then abruptly jumps track and launches into a long list of all the curses that He has brought on His people. Singing about “counting your curses” might not send everyone away with a pleasant smile on their face, though. The movement in the Psalms, and the goal in our own lives, is towards joyful praise. But the road from despair to worship often has to first pass through lament. Songs like “Count your Blessings” often seem to downplay the reality and immensity of our troubles, sending the message that if we would just focus on the positive rather than the negative, all our problems would just go away. If only the solution were so simple! Formulaic, moralistic approaches to comfort are more likely to heap additional guilt, isolation, and wounding on a person barely managing to keep their nose above water. They don’t need another sermon; they need a life raft! I cried out to God for help; I cried out to God to hear me. When I was in distress, I sought the Lord; at night I stretched out untiring hands and my soul refused to be comforted. That being said, I do see a form of “Count your Blessings” in many of the Biblical prayers, Psalm 77 in particular. The psalmist doesn’t jump straight to the blessings, though. First he cries out his distress and troubles to God, refusing to be comforted until they have been properly addressed. 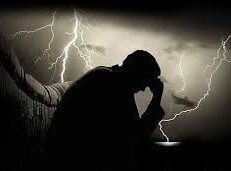 As he considers his current misery, he verbalizes to God the horrible doubts that his recent experiences have forced him to consider. These are the disturbing questions that have been simmering under the surface, questions about the character of God and the nature of their relationship. They seem too heretical to put into words, but if he doesn’t ask them his soul will remain in turmoil and their relationship will remain unresolved. Even as the psalmist hears the questions stated out loud, he recognizes how preposterous they are. God “forgetting” to be merciful? Unfailing love that fails? Then I thought, “To this I will appeal: the years of the right hand of the Most High.” I will remember the deeds of the LORD; yes, I will remember your miracles of long ago. I will meditate on all your works and consider all your mighty deeds. Your ways, O God, are holy. The psalmist desperately wants to get beyond despair and back into praise, but he refuses to shortcut the process and shortchange the relationship. So instead he appeals to the history of God’s dealings with His people. He chooses to remember the things God has done in the past, to count the ways He has already proven His love and shown His goodness. Memories of God’s incredible rescues and tender mercies come flooding in. In the past when troubles overwhelmed God’s people, He always showed up and delivered them, even when they couldn’t see Him doing it. This time will be no different. Finally, his soul can be a rest again. God has been good to him, and God will once more be good to him. The movement in the Psalms, and the goal in our own lives, is towards joyful praise. But the road from despair to worship often has to first pass through lament. Interestingly, lament rarely manages to sustain itself for too long. Once it has served its purpose, lament fades away and leaves room for gratitude. And at that point, counting our blessings is a helpful life buoy in lifting our spirits back to joy. “I know God is there, but right now He feels so far away it is hard to believe He even cares. I try to pray to Him, but it doesn’t change anything. What happened to the God who is supposed to love me and hold my hand through the hard times? It’s hard enough dealing with everything else going wrong in my life right now, but the thing that hurts the most is that He won’t even show up to reassure me that He cares.” I listened to my friend’s gut-wrenching honesty about her struggles with God in the midst of her depression and I remembered times when I had felt the same way. Turning to the Psalms, I discovered that we were not the only ones. How long, O LORD? Will you forget me forever? How long will you hide your face from me? How long must I wrestle with my thoughts and every day have sorrow in my heart? Miserable. Alone. Disturbing thoughts. Despairing heart. Once upon a time, David had experienced the joy of hearing from God, of seeing His hand at work in his life in powerful ways. Once upon a time he had enjoyed the unchallenged certainty of God’s goodness and love. But all that was such a distant memory, it was hard now to believe it had ever really been true. Now heaven seemed steely and prohibitive, heaven’s God silent and removed. David kept calling out to Him in distress, begging Him to hear and answer, but nothing happened. Nothing changed. The people around him who didn’t care about God or bother with conforming their lives to His standards seemed perfectly happy, while he was miserable and afflicted at every turn. It would have been easier if God had not raised his expectations with promises of the honor and security of a throne. It was difficult to reconcile those promises with the fact that, instead, he had been living for years as a hunted vagabond, hiding out in caves and having to drool on himself like a madman so his enemies wouldn’t kill him. Where was God now? How could he keep believing in His promises when everything around him seemed to prove them false? Look on me and answer, O LORD my God. Give light to my eyes, or I will sleep in death. David was at the end of his emotional rope. His faith reserves were exhausted and he was on the verge of losing it. If God didn’t turn and respond to him in some way, he wouldn’t be able to keep going. Past experience of God’s goodness is the life raft that carries us through the present experience of His silence. But God had already responded to him. He had already met him in tangible ways. He had proven His great love in the past. Miraculous rescues. Intimate encounters. Beautiful prophecies. Worshipful moments. They had all been so real. Did they count for nothing now? David was faced with a difficult choice. Which experience of God would he believe: His former kindness or His current indifference? But I trust in your unfailing love; my heart rejoices in your salvation. I will sing to the LORD, for he has been good to me. In an act of desperate faith, David clung to the reality of God’s unfailing love. His situation was still wretched, but he chose to let the past interpret the present. God’s love had never failed him then. He could only hope that it would not fail him now. His story wasn’t over yet. He would wait in hope to see how God would prove His love in the middle of this mess. When life stinks and God is silent, we are faced with the same choice. Everything around us screams that God doesn’t care, drowning out that still, quiet testimony within our hearts that He does. We want to keep believing, but we need some sign of His love to offset the overwhelming evidence to the contrary. He doesn’t always give us that sign on demand, but He has given us ample proof of His love in the past. Past experience of God’s goodness is the life raft that carries us through the present experience of His silence. O LORD, the God who saves me, day and night I cry out before you. May my prayer come before you; turn your ear to my cry. For my soul is full of trouble and my life draws near the grave. I am counted among those who go down to the pit; I am like a man without strength. I am set apart with the dead, like the slain who lie in the grave, whom you remember no more, who are cut off from your care. You have put me in the lowest pit, in the darkest depths. Your wrath lies heavily upon me; you have overwhelmed me with all your waves. You have taken from me my closest friends and have made me repulsive to them. I am confined and cannot escape; my eyes are dim with grief. I call to you, O LORD, every day; I spread out my hands to you. Do you show your wonders to the dead? Do those who are dead rise up and praise you? Is your love declared in the grave, your faithfulness in Destruction ? Are your wonders known in the place of darkness, or your righteous deeds in the land of oblivion? But I cry to you for help, O LORD; in the morning my prayer comes before you. Why, O LORD, do you reject me and hide your face from me? From my youth I have been afflicted and close to death; I have suffered your terrors and am in despair. Your wrath has swept over me; your terrors have destroyed me. All day long they surround me like a flood; they have completely engulfed me. You have taken my companions and loved ones from me; the darkness is my closest friend. How do we pray to the one who is wounding us? How do we relate to the God who is orchestrating our mess? We can pretend like it’s not really Him. We can focus on His goodness and live in denial over the pain He brings. Or we can get angry and withdraw. We can turn away and refuse to communicate with Him. But neither of these responses will bring reconciliation to our damaged relationship. Neither will bring resolution to the wound festering within our own soul. We understand the need for conflict resolution within human relationships, but conflict resolution with God is not really that different. It requires honesty, open communication, and dogged perseverance. It takes unswerving commitment to the relationship and a willingness to wrestle back and forth until both parties emerge heard, understood, and re-united. Laments are conflict-resolution prayers. They are gutsy refusals to quit on our relationship with God or to settle for a polite, distant co-existence with Him. When we read the whole Bible and not just the nice, tidy parts, we run into lengthy sections of messy people screaming out their anguish to God. Unspeakable horrors. Irreverent feelings. Dangerous questions. All the things that would shock the stockings off our Sunday school teachers, brought right into God’s presence and laid out in the form of a complaint before His holy throne. Are we really allowed to be so bold? With all that is on the line, we can’t afford not to be. Laments are gutsy refusals to quit on our relationship with God. Thankfully, God not only allows us to lament, He teaches us how to do it. The Psalms and the prophets provide excellent models for how to voice our complaints to God. He even provides the words ahead of time for His people to use in their hour of despair. When Jesus cried out His agonizing question to God on the cross, He was merely borrowing the words that had been provided for Him centuries in advance through the Psalms. Whether we borrow the words of Scripture or come up with our own words to express the agonized cries of our hearts, we are following in good footsteps. Lament has long been the prayer of the faithful. We could use some lessons in this lost art. Teach your daughters how to wail: teach one another a lament. I know I shouldn’t be, but I have been surprised by the number of wounded individuals who have responded to the raw, unresolved pain of my last post with stories of their own suppressed suffering. I say suppressed because for many of them, well-intentioned Christian “comforters” have compounded their pain, not alleviated it; praise-filled church services have crushed their spirits, not lifted them. What’s wrong with this picture? I suspect that many Christians are too threatened by the immensity of pain to be able to engage it. It scares them, because if they look it straight in the face, they might lose their joy, might start to question God’s goodness, might even be in danger of losing their faith! So they escape into exciting praise songs, testimonies with happy endings, and repeated reminders to be thankful and joyful all the time. But where does that leave the wounded? Out in the cold. Isolated, hurt, and now with a generous serving of guilt on top. The Jewish exiles shared a similar experience. Their homes pillaged and burned, their loved ones raped and murdered, their temple desecrated, their country destroyed, and themselves hauled off as helpless captives, they sat in the prison of a strange, scary place with nothing but the painful memories of all they had lost. Traumatized. Grieving. Broken. Their hands hung limp. Their harps hung unused. There are times when songs of joy are just wrong, when cries of lament are the truest form of worship. As if that weren’t enough, their captors came around to taunt them. “Sing us one of your praise choruses! You know, the catchy tunes you used to sing back home.” Worse than another blow to the body, this kind of torment violated their souls. It made a mockery of their pain, requiring them to pretend that nothing had happened and that everything was fine. The exiles did not give in to the pressure. They refused to join the farce, to surrender the last few shreds of dignity they had left. How could they enact the lie of being joyful when they were anything but? Instead they used their voices to express their agony over the horrors they had endured. They called on God to remember all that had happened to them, and not to forget it until He had made it right. God did not condemn them for refusing to be joyful at that moment. Rather, He recorded their laments for our benefit. There are times when joy is just wrong, when faking praise only further isolates us from God. There are seasons when lament is the truest form of worship, the only honest way we can relate to God. This is not a permanent state, but rather a necessary stage on the road back to joy. Embedded within the New Testament calls to “be joyful in hope”(Rom. 12:12) and to “rejoice with those who rejoice”(Rom. 12:15) is also a reminder to “mourn with those who mourn”(Rom. 12:15). Whether we find ourselves currently in a season of celebration or in a season of despair, love compels us to acknowledge and share in each other’s emotional realities. Compassionate tears. Shared laughter. Heart-rending cries for mercy. Heart-filled songs of praise. This is the stuff that binds us together as the church, with our weeping, worshipping Savior at the core.